By Agus in Mobile. Updated on February 1, 2016 . No matter how advanced your smartphone is, multi-tasking on it is a living nightmare. We are limited by the small screen on a smartphone or tablet and its insistence on allowing us to use only a single app at any viewing. It is probably easier to manage a ton of media, such as our photos, videos and music on the desktop. This is where tools like what you see in this post comes to play. Apart from being able to transfer large files from mobile to desktop, it also allows us to better manage the files and materials in our mobile. A few of these apps even gives us access to the phone’s camera, or to take mobile screenshots from the desktop. Most importantly, we can do all this without being limited by the different desktop OS. Let’s check out the tools you can use to manage your Android from your desktop. Install the app for Android or iOS. Open the app. Open Airmore Web on your PC browser, and scan the QR code displayed. Click "Accept" on your mobile. Alternatively, connection can be made via IP or code or mobile hotspot connection as well. With Airmore, you can connect your Android to Mac, or iOS to PC as well. For troubleshooting help, check out their help page. Airmore lets you manage all files both on phone memory and SD card, and of course, transfering files between phone and PC is easy. ConnectMe allows you to stream any video or any other media saved on your phone. You can even link to the phone camera and watch the feed from the desktop. On top of that, you can send SMS and making phone calls with ease without touch your phone. It will even notify you when someone calls you or sends you a message. Using your home WiFi, visit the web address shown on the app or login to web.gomo.com on your PC’s browser. Click ‘OK’ on your phone to connect. Alternatively, you can connect your PC to your phone’s WiFi with a name generated by the app. Open the URL shown on your phone with your PC browser. Connect Me works with Windows, Mac, Linux, Chrome OS and even Smart TVs. The app also lets you send ringtones, clipboard data, APK files or push URLs to your phone. 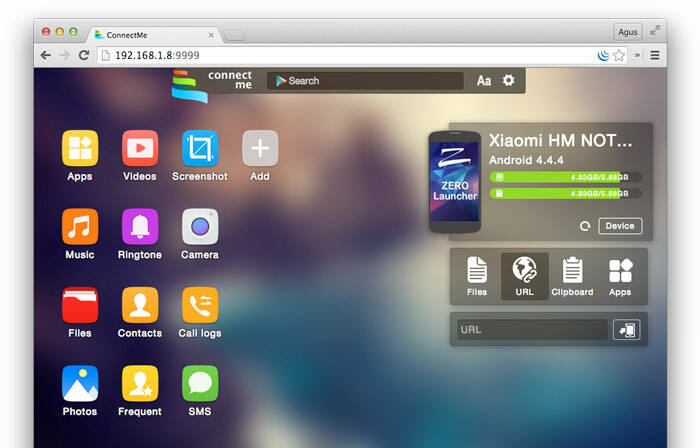 With root access, you can even take screenshots of your phone. 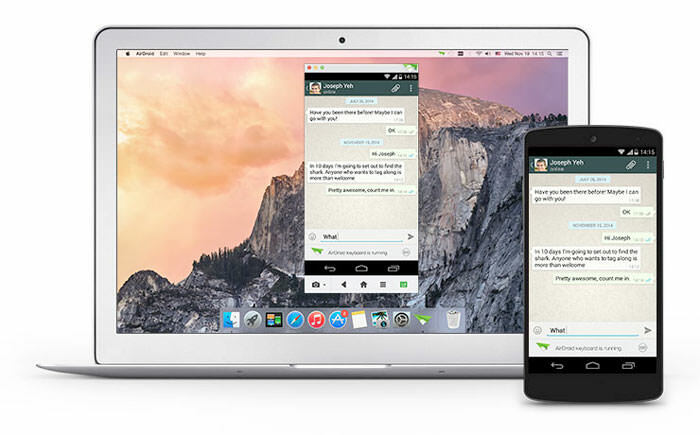 Airdroid is one of the most popularly known Mobile to PC apps out there and it comes with a plethora of features. These features include being able to show notification from incoming calls or messages, as well as app notifications from messaging apps like Whatsapp. Getting an Airdroid account allows you to find your phone. Install Airdroid, and open the app. Open Airdroid Web and scan the QR code to connect. Alternatively, you can download the desktop app for Windows or Mac OS X. Starting the app on the desktop will launch the app on your mobile. Apart from that Airdroid also works well when transferring files between phone and PC, and also lets the desktop link to the phone’s camera. A cool feature it has is AirMirror, which allows you to run your Android app right from your PC with the same interface on your smartphone (but this requires root acess on your Android). Web PC Suite enables you to see and stream your photos, music, videos, documents, APK, and other kind of files from your Android to PC, via WiFi or personal hotspot. The interface functions via drag-and-drop. Go to the website and scan the QR code there. Alternatively, you can login via your account as well. Web PC Suite works across a wide range of desktop, mobile and tablet platforms bridging transfers between Android, iOS, Symbian, Windows Phone and Blackberry with PC, OS X and Linux. Mighty Text is created for those who still text via SMS for reasons we will not explore here. 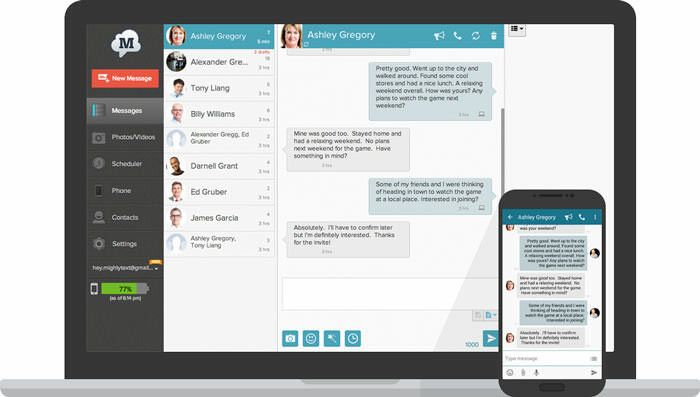 But basically, with Mighty Text, you can send or receive SMS or MMS on your PC using your current phone number, or send an SMS from your Gmail account. The app comes with a PowerView which lets you carry multiple conservations in one go. On the installation page, insert your Android phone number to get the app sent to your phone. Install the plugin or extension for your favorite browser. To send text from Gmail, get the required extension on the same page. Launch the Web App to start using. The app also notifies users of incoming app notification to their phone, and allow these notifications to be dismissed on the PC. The app also has syncing abilities for photos and videos, and you can add filters to your photos right on the PC. There is a Pro version of this app gives you extra features such as to send and reply to text messages via email, changing the themes, block numbers, create templates and signatures as well as schedulling messages. Xender is great app to transfer everything from files, photos, music, videos to apps between two Android phones or from Android to a PC, Mac or iOS devices. 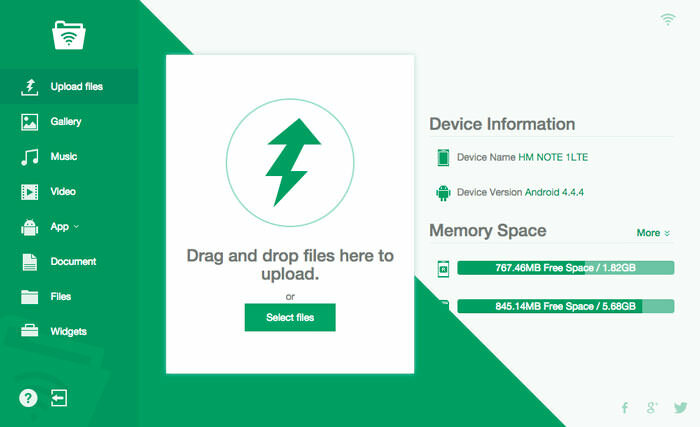 The Connect PC mode allows users to see the all the files found in their phone, from apps, photos, videos, music and even files from your phone storage. On your PC browser, open web.xender.com. Download and open the app on your mobile. Tap on the Transfer button and choose which device to transfer to. If you choose Mac or PC, you will need to choose to scan QR code on your mobile. Scan the code to connect. Xender’s phone to phone transfers incur no data usage, and supports file transfers between iOS and Android devices seamlessly. Two cool features Xender has is that you can create a group of up to 4 devices, and regularly share your files to the same group, and it is a great app to replicate your phone: you can transfer everything you need from your old phone to your new phone seamlessly. 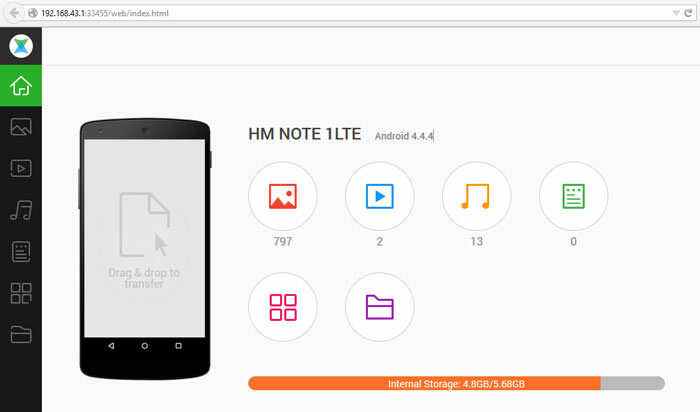 Mobizen lets you access and transfer files between your Android and your computer, and lets you access all multimedia files on your phone, including contacts and calls. Mobizen also allows you to share music to your speakers and photos and videos to your larger desktop screen, record your Android screen (minus the rooting), and use your Android from your computer screen. Install the application on your Android. There are two options: one for Samsung devices and the other is for non-Samsung devices. Log in both the Android app and the web app. You will receive a 6 digit pin that you need to input in the Android app to connect. You can be connected in several ways: WIFI, USB or even 3G / LTE connection. For the fastest connection, USB connection is the best. The app runs very slowly when I connect via WiFi. Mobizen also comes with a "Find my Device" feature to help you locate your phone, which would be helpful if their over the air connection is better. WiFi File Transfer does what the rest of the apps in this list do, but in a relatively traditional way. 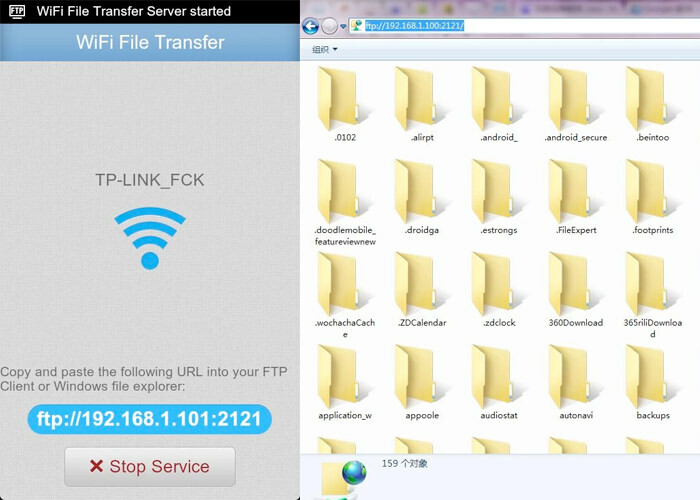 With this small app you can browse all of the files and folders on your Android via WiFi by FTP (File Transfer Protocol). Ensure your Android and PC are on the same WiFi network. Open the application and click "Start Service". Copy and paste the URL address displayed in the app, into your FTP client application, or Windows Explorer (if you are using windows) or simply open the URL in the browser. You will find all the files on your Android. If you use an FTP client, commands such as copy, delete or download files exist on the default FTP client application. You won’t find these commands on the browser however. Basically, this app can do fast, secure and efficient transfers but you will have to do it without a user interface.